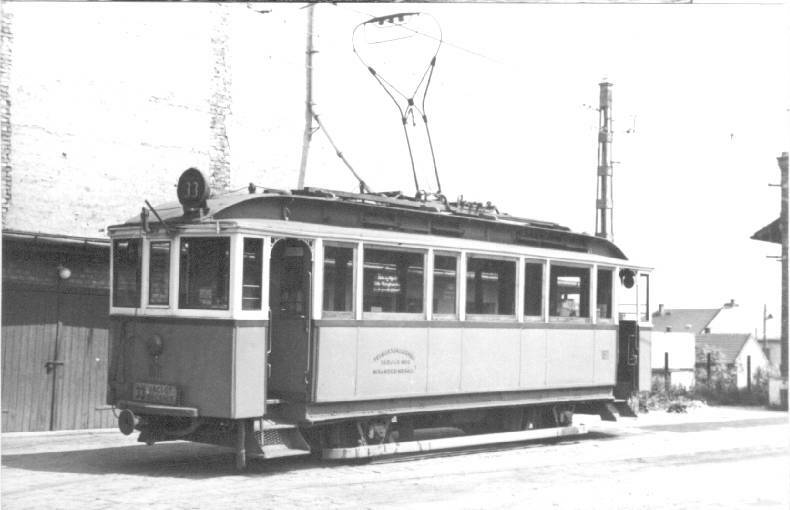 The Budapest Street Railway Company (BKVT) and BudapestEnvirons Street Railway (BVKV) bought alltogether 40 tramcars in 1896 and1897 of the type F on the number 201-240. 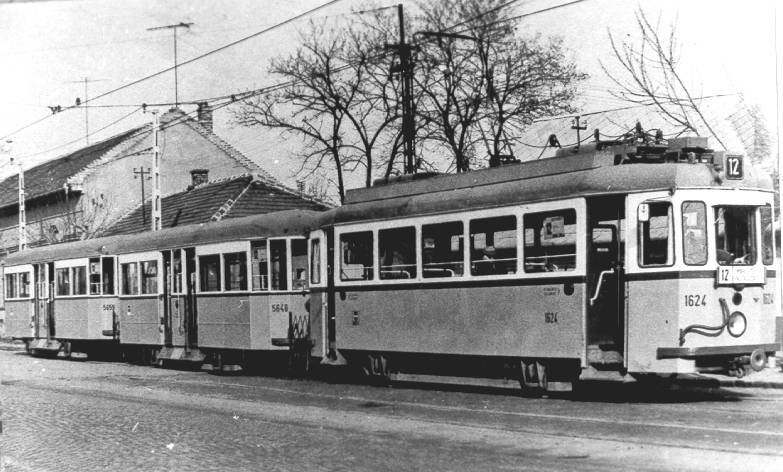 The BKVT cars was used as tramsafter the unification of tram companies (1923), but the BVKV cars werein property of Budapest Local Railways (BHÉV). 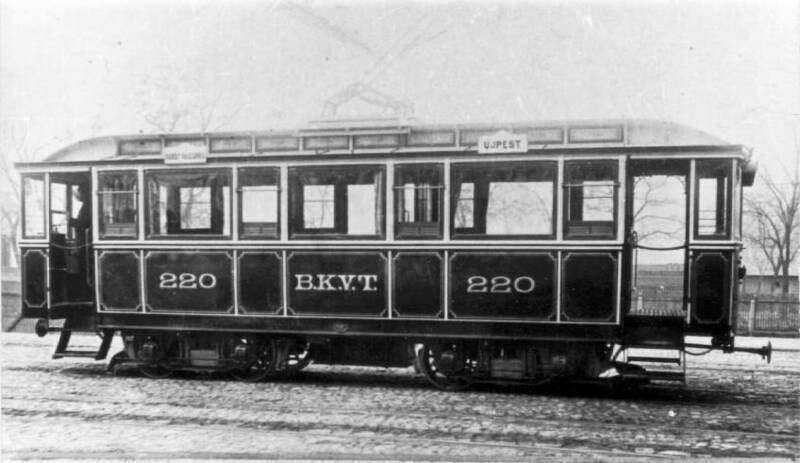 The BKVT's # 220 car in its original outfit. 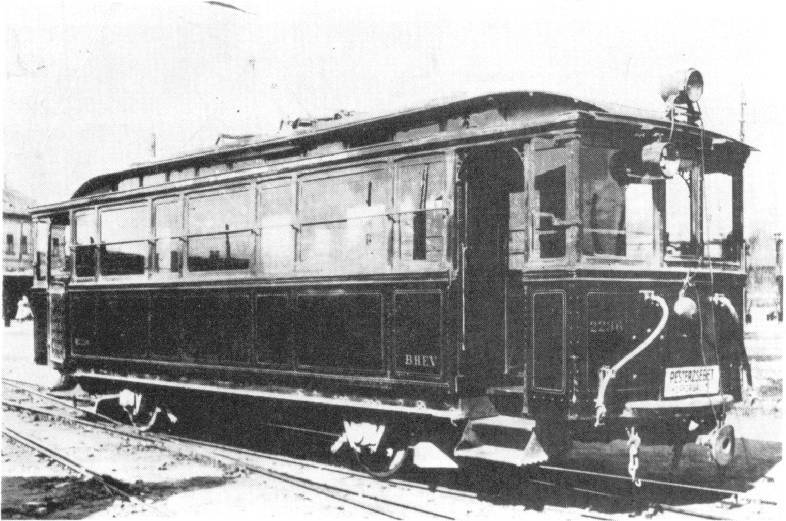 The car had two motors (2 x 20 HP), but for the long car the producerSchlick factory built bogies. This was because in this early cars the solidaxles (if they were wider than around 2 meters) wouldn't be suitable forsharp radii of the tramtracks. The later types recieved radial trucks -the axels could move and fit in the curves. 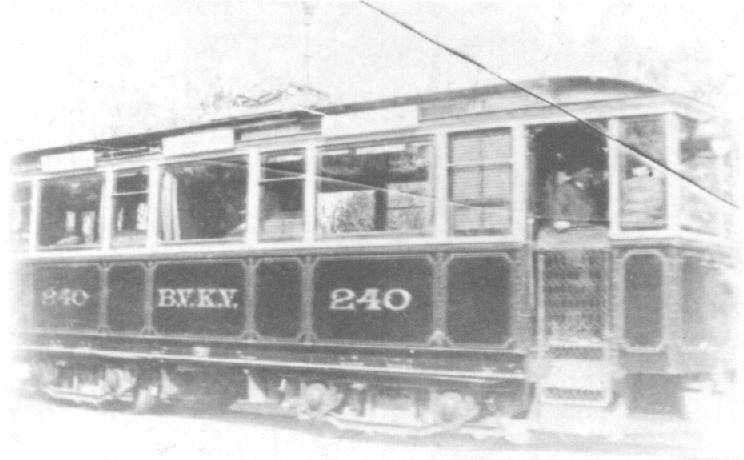 TheBVKV # 240 tramcar in its original form. The BVKV was in the property of BKVT, that's why these cars recievedtheir numbers after the BKVT cars. 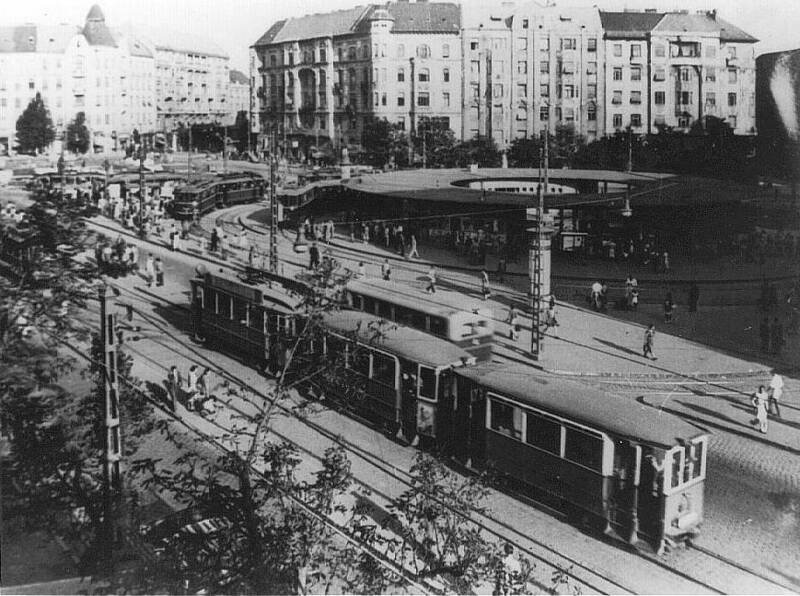 The BVKV had two lines in Újpest. 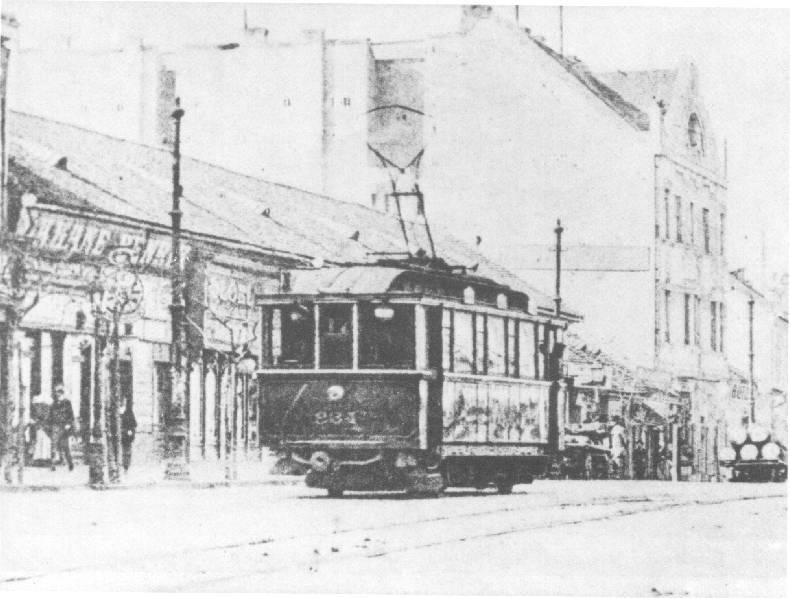 TheBKVT's # 218 car on Vilmos Császár út (today Bajcsy-Zsilinszky út) (around1900). The cars of BKVT used conduit in the city, so they had plough. BVKVcar # 234 in Újpest (in the '10s). From 1909 these cars were rebuilt with radial trucks, so the bogieswere removed - at this time their type became F1. Also recievedmore powerful motors (70 HP), so they became suitable to pull trailers.Another improvment was the using of pneumatic brakes, that was appliedon these cars from the early 1900s. 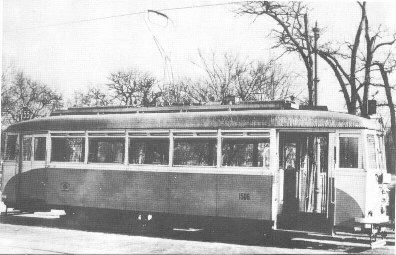 In the '30s the # 1521 tramcar of BSzKRt. From 1923 the BSzKRt renumbered the cars to its scheme: the seriesrecieved the numbers 1500-1529. 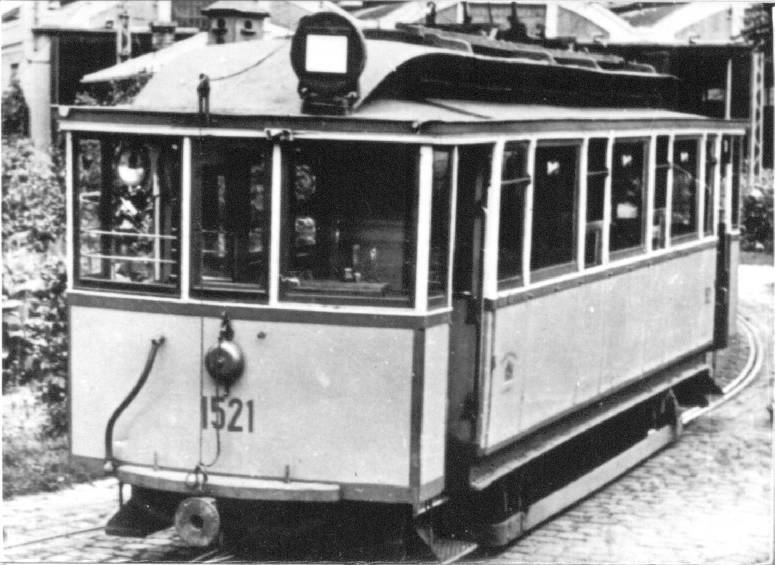 Theex BVKV car 236 as # M2236 in the property of BHÉV at Vágóhíd endstationin the '20s-'30s. 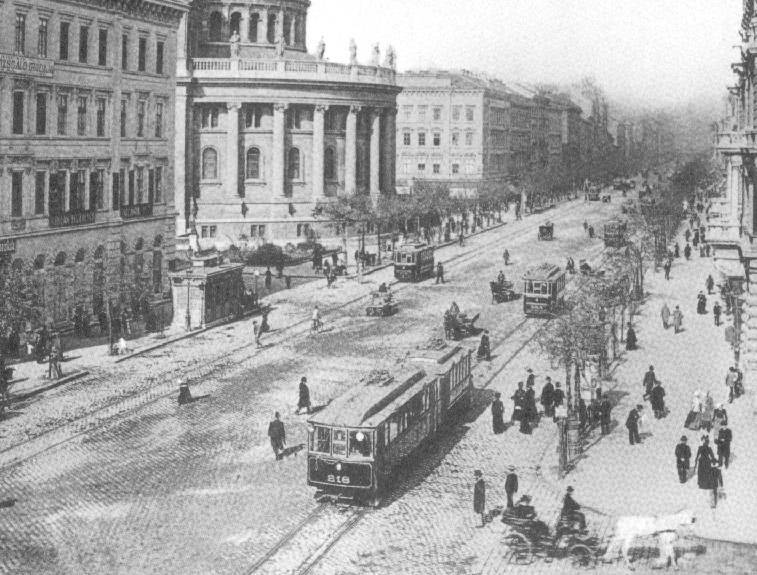 The voltage of BHÉV was usually 1000 V, but on the section betweenVágóhíd and Pesterzsébet loop was only 500 V. The interurban trains toDunaharaszti ran in this section only at half voltage, but skipped thestops of these local trains to Csepel and Pesterzsébet. The BVKV cars (wichwere the M VI type by BHÉV) ran always full speed with their original 550V motors. During the war, Csepel was a major industrial centre, so theM VI pulled 2 or 3 trailers during the shift-change. In1938 the BSzKRT's tramcar # 1506 was rebuilt with wooden body to a modernoutfit with double telescopic doors. Two more cars was rebuilt with steel body and double (non-telescopic)entrance, then the workshops started to build after these plans completlynew cars type F1A. These cars also were in the series of 1500. 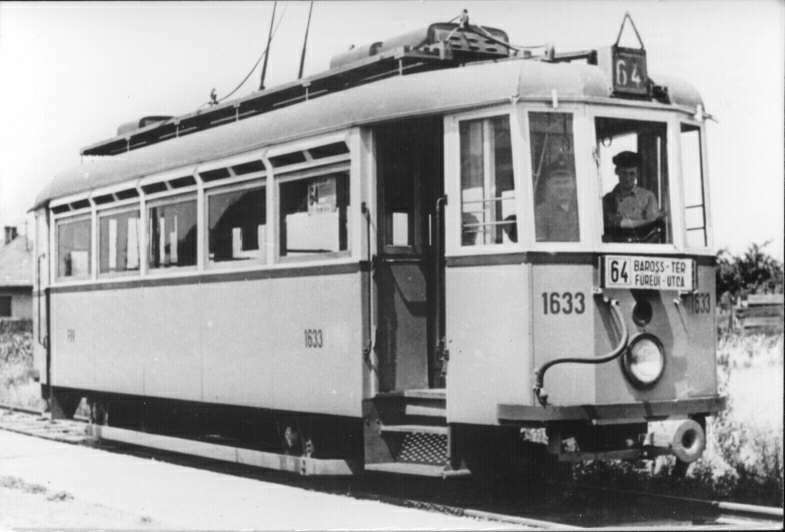 Thetramcar #1611 in Óbuda depot in the '50s. During the '50s the F1 cars were renumbered to the1600 series - separating them from the F1A (1500er) type. Onthis picture there's a green colour twin car of ex M VI type of cars onthe outer loop. The picture was taken around 1951 at the Móricz Zsigmondkörtér - the terminus of Budafok BHÉV line. Two twin units were made around 1950. Peculiarly these twins weren'tsymmetric: one full motored car was joint to a driving trailer (a sameM VI car without any motors, only one controller). In these years the FVV(Capitol Trams) took the BHÉV's Budafok line with all M VI cars, and usedthem to serve the local trains to Albertfalva. 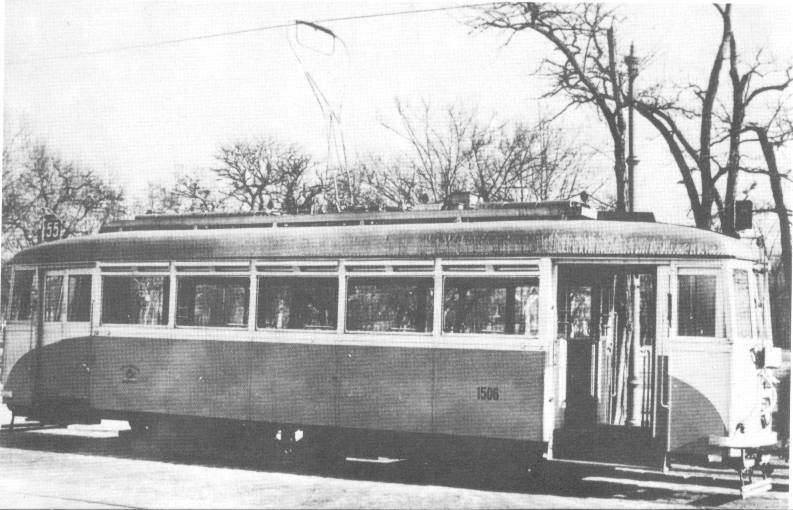 From 1956 they were all tramcars, and recieved steel body.They were in use until 1981. In1957 the # 1634 (originally BVKV # 239), at the terminus of single trackline 13 at Üllői út. 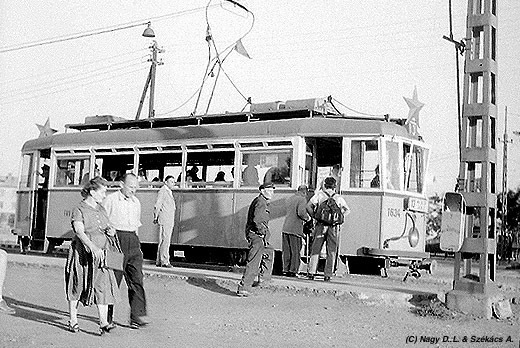 From 1956 these were the first tram type, that recieved a newuniform steel-body outfit. Thecar # 1633 at the terminus of single track line line 64 at Vezér út (after1956). 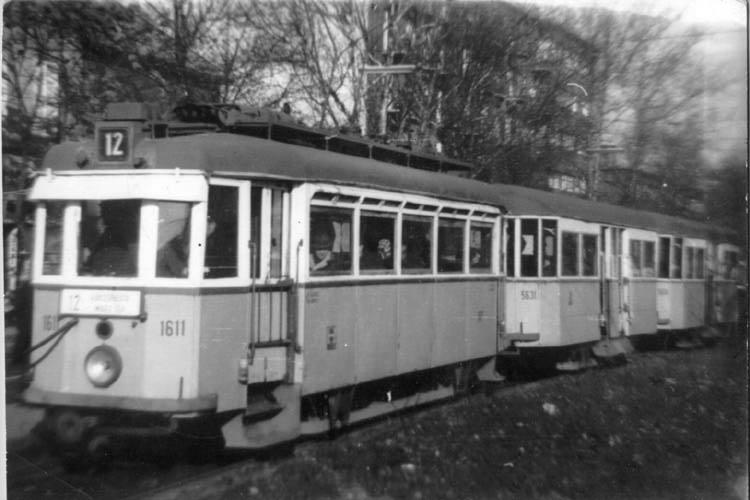 Thecar # 1611 on the line 12 with two 5600 type trailers near Lehel tér (around1970). The# 1616 on the line 12 at its terminus Kádár utca (Nyugati pu.) (in thelate '70s). The BKV installed telescopic doors on the cars, wich was eitheroperated manually or pneumatically. Some cars recieved pantographs. 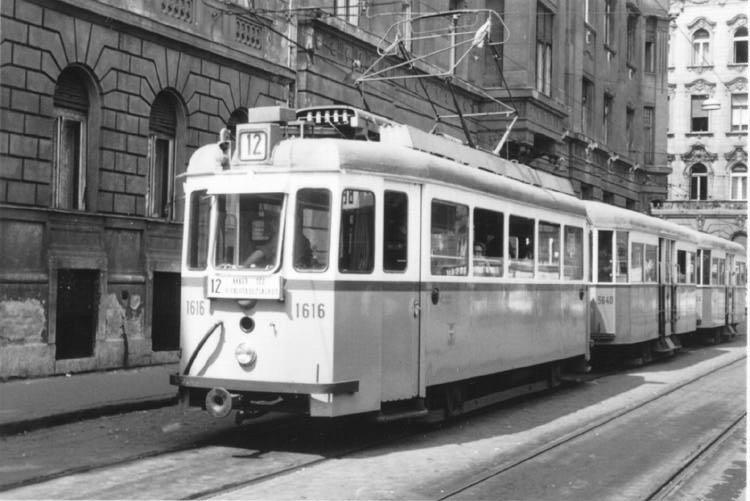 Thecar # 1624 in Rákospalota terminus of line 12 (in 1974). The type was scrapped until 1981. Until that the two-trailer trainswere in use in Újpest on line 3,12,55. 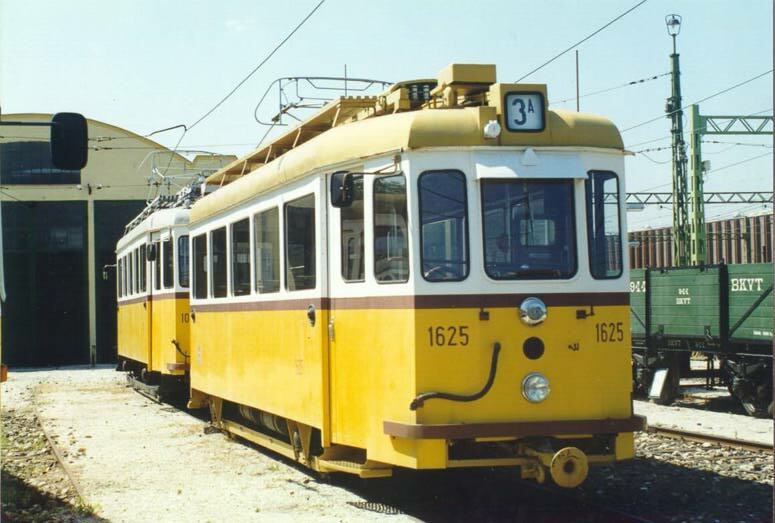 Thecar # 1625 - the only remaining car of BVKV is in Szentendre, in the Museumof Urban Transport.